Interested in installing track lighting in your home? A track light setup is a versatile way to provide a room with plenty of adjustable light, without compromising great performance. Tracking lighting systems can power spotlights, floodlights, pendant lights, and other fixtures in ceilings that can’t accommodate recess can lights due to beams or other architectural obstructions. The presence of beams in a ceiling can make it impossible to install recessed lighting. A track light system is an appealing, versatile alternative. Track lighting keeps the fixtures close to the ceiling, preventing them from making the space feel smaller than it is. It’s great for directing light at specific objects, like art pieces or entertainment centers. It’s easy to adjust, so when you rearrange a room, you can change the lighting to suit the new layout. Track lighting has several benefits over other approaches to room illumination, especially in cases where recess can lights aren’t an option. It’s versatile. With track light systems, you can choose which direction the individual lights will point,and you can adjust them later. You can also change how lights are spaced along the track. If you have artworks or other features in your home you’d like to highlight, track lighting is a great way to position a spotlight in the perfect location. It’s simple to install. Track lighting is fast and easy for professional electricians to install for you. The track itself is the centerpiece of your track lighting system. This is what attaches to the wall or ceiling to hold the actual lighting fixtures. There are three different industry standards, and numerous proprietary systems. Among these, you can choose different lengths of track, whether linear or flexible, and different connectors to join track lengths together. There are also track suspension kits that let you hang the track a bit below the ceiling, which work well in rooms with an exposed high ceiling. A track lighting system consists of lengths of “track,” which are available in different types. You can choose between line and low-voltage, single-circuit and two-circuit, and flexible or straight construction. The track’s manufacturer, adapter standard, and voltage will determine what fixtures are or are not compatible with it. With a creative combination of track lengths and connectors, you can create almost any layout for your track lighting. Some tracks are installed directly to the ceiling, while others are suspended just below it. You will need lighting fixtures that are compatible with your track light system, although some manufacturers may offer adapters that let fixtures fit into multiple kinds of tracks. You’ll also want to choose which type of fixtures you want at different locations. Spotlights are great for highlighting a piece of art, while flood lights and pendant lights are more suitable for general, diffuse illumination. Special lenses are available that change the shape or color of the light, adding extra personalization and customization. Like recessed lighting, track lighting is compatible with energy-saving LED bulbs. These safe, sturdy bulbs last for over a decade, meaning you won’t have to buy new bulbs any time soon. In most cases, the wiring of a lighting fixture breaks down long before the LED bulb itself burns out. With LED track lighting, you’ll enjoy considerable energy savings, not to mention savings on the cost of new lightbulbs. Residential LED bulbs use about 75% less energy than incandescent bulbs. By 2027, it’s estimated that widespread adoption of LED lightbulbs will save a total of 348 TWh of electricity. That’s the annual output of 44 large power plants, worth about $30 billion dollars. 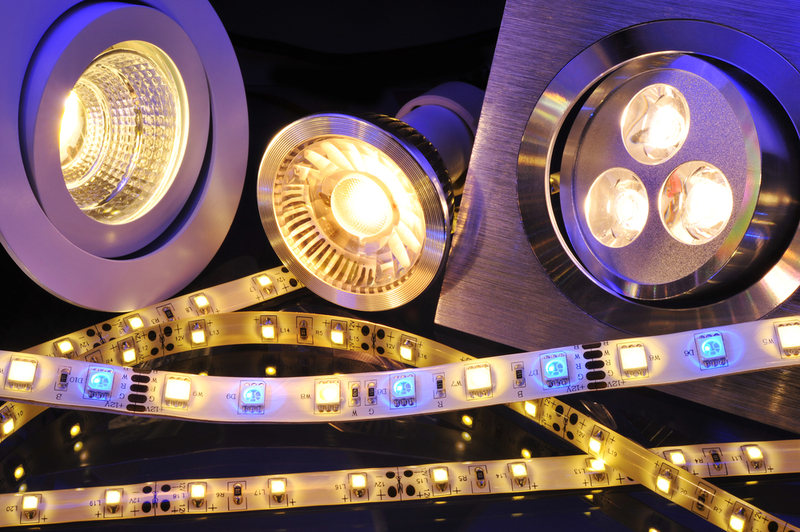 LED products are available in a range of colors, allowing you to create lighting with a quality you love. Red, green, and blue LEDs, each the size of a pepper grain, combine to make pure white light. You can also find bulbs that create warmer or cooler light colors. At The Electrical Pros, we specialize in installing LED recessed lighting and track lighting for Canyon County homeowners. To find out more, call us any time.